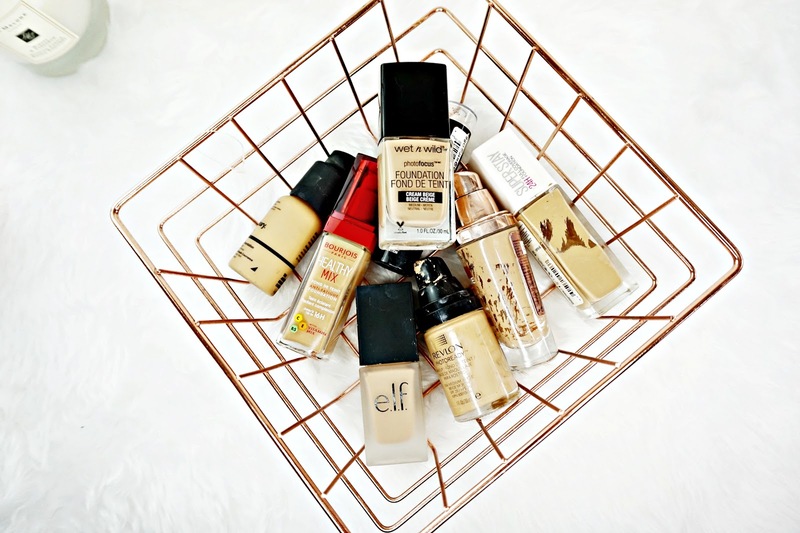 Ahh affordable foundations, where do I start? I mean, some can be really good. Others can be really bad. So today I wanted to share some that are amazing and some aren't. I've tried to keep this to foundations I don't often talk about. Regular readers will know how much I love my LA HD Illuminate and my Milani 2in1 but today here are few that go under the radar. This foundation has been a favourite of mine for a long time. As the name suggests this is a dewy foundation that gives the skin a luminous finish. The formula is light and easy to blend. It has a light to medium coverage that can be built up. I love how healthy this makes my skin look, and sits really well over any dry areas, I don't find this sinks into my pores. And with a good setting powder this lasts all day on me. It's the perfect everyday foundation, if you want a bit of coverage that's not to full. Maybelline has reformulated their Superstay foundation a few times, I think this is the 3rd edition. And it's by far the best! It claims to offer coverage that doesn't budge all day. And it's a pretty true claim. The coverage is really full and I've had no issue with the wear what so ever. It has a satin finish but I tend to use it with a dewy primer to give it more of a luminous finish. It sits well over any dry patches and it doesn't cling to any problem areas. The formula is slightly thick but it blends really easy with a Beauty Blender. It also works well with a brush but the finish is just about more flawless with a Beauty Blender. I actually think it is a really good dupe of the Huda Beauty foundation. I have a comparison post here. I'm so happy this is now available in the UK via Amazon here. For ages it was only available in the States. But this is such a good affordable foundation! And when they say Pro Glow they aren't messing around, this is definitely a dewy foundation. I do find that without a good setting powder this can turn a little shiny as the day progresses, but with a setting powder this gives me a dewy, glowing finish all day. In terms of coverage i'd say this is medium. It covers most of my problems without looking cakey and without looking like I'm wearing loads of foundation. It looks very natural, well as natural as a dewy foundation looks. It's super runny which makes it really easy to blend too. Overall, in terms of coverage and finish this is a brilliant all round foundation. I picked this is up the US but I think it's available on Amazon if you're in the UK. I really like this foundation and it's really at the cheaper end of the scale, which surprises me because this is so good. It claims to be a blurring, undetectable foundation. Which I don't know about either but I think it's really difficult to make get a foundation to look like you're not wearing a foundation at all but this does look very natural! It gives my skin a uniform, flawless finish. The coverage is medium to full and covers everything I want it to. In terms of finish this has a satin finish that has a radiance to it, that I really like. Other makeup products sit really well on top of this too. Stick foundations are the in thing at the moment. Don't let the fact this is a stick put you off because this isn't cakey or anything at all! It glides onto the skin and blends in so easily. I like to use a brush with this, it does work well with a Beauty Blender but I just find it's easy to use a brush. It looks so natural once it's blended. The coverage can be built up to full or sheered out to light depending on preference. It has a satin finish and amazing staying power. It wears all day on me with no issues. I really can't recommend it enough. I feel like I did like this one when I first got this but now I have loads of affordable foundations that I would pick over this. This does have full coverage and a natural matte finish but I don't love the way it looks on my skin. It doesn't look bad as such but I just have other foundations I prefer. The consistency isn't something I typically like either, it's like a mousse and comes out of the tube it comes out really thick. That being said this does blend out easily. But I just don't love this and they are way better foundations at the same price point. This offering from ELF is nothing groundbreaking. I don't hate it but I don't love it. It's just a meh and the shade is completely wrong for me. The foundation itself is kind of thick and isn't the most blend-able foundation ever but not the worst. I like that it has a satin finish that can be made more dewy. It also has a good medium coverage that wears well throughout the day. This is an ok foundation but I just don't love and never reach for it. The original photo finish foundation used to be my holy grail, I loved it! And then Revlon thought it would be a good idea to reformulate it, which for the life me I can not think why because this is rubbish in comparison. It has random glitter particles in it and the finish is far from photo ready. It looks all dry and cakey on my skin. As the day progresses I find this so drying on my skin as well, which I hate. The only good thing about this foundation is it's medium coverage. I used to love this foundation back in the day. I loved the radiant finish it gave my skin while still having a satin finish. It made my skin look really healthy. I'm not sure if this has been reformulated but this doesn't have the effect on my skin any more. It looks a little dry and feels drying on my skin. The coverage is pretty decent but I don't like the way this actually looks on. So for that reason I don't love this anymore. Like the L'oreal Total Cover foundation I liked this when I first started testing it but I think my skin has changed and this no longer works for me. It does have a pretty decent medium to full coverage and the formula is easy to blend in. But this just doesn't sit right on my skin anymore. It exaggerates any problem areas and makes my pores look ginormous! Which is never a good look. Have you tried any of these? What's your favourite affordable foundation?